The German prosthetics company Ottobock made it into the headlines last week with its release of the powered C-Brace for the British market. Ottobock was founded in 1919 as a response to the large number disabled soldiers following WWI. Since then, the company has stayed true to its vision and has grown into a giant conglomerate with over 7000 employees in 2013, branches in 50 countries and sales of 861.3€ million Euros ($975.5 million) (information taken from the Ottobock Group website). What is unique about Ottobock is that every other Exoskeleton company has started with the robotics components and then tried to attach them to the human body. In this case, Ottobock is starting with nearly 100 years of experience of attaching braces and mechanical parts, and is now looking to add sensors and motors. It may not seem like a big difference, but the human body has few areas that are able to tolerate tight braces, belts, or harnesses. 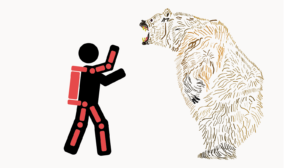 The nervous system at the skin can get irritated, sweating and swelling can cause major discomfort and interfere with the exoskeleton fit and sensors. Ottobock’s experience utilizing prosthetics can put them well ahead of many other exoskeleton companies, especially ones designing for able-body customers. 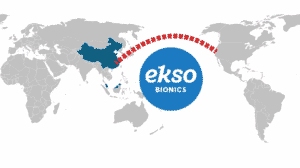 In November of 2014, Globalnewswire.com reported that Ekso Bionics has reached an intellectual property licensing deal with Ottobock. Whether Ekso Bionic’s technology made it into the C-Brace or it will be used in a later model is unclear. The C-Brace is designed to strengthen the leg of a person who only has partial motor control. The C-Brace’s sensors measure knee angle, direction and velocity, acceleration and deceleration as well as ankle flexion and extension. 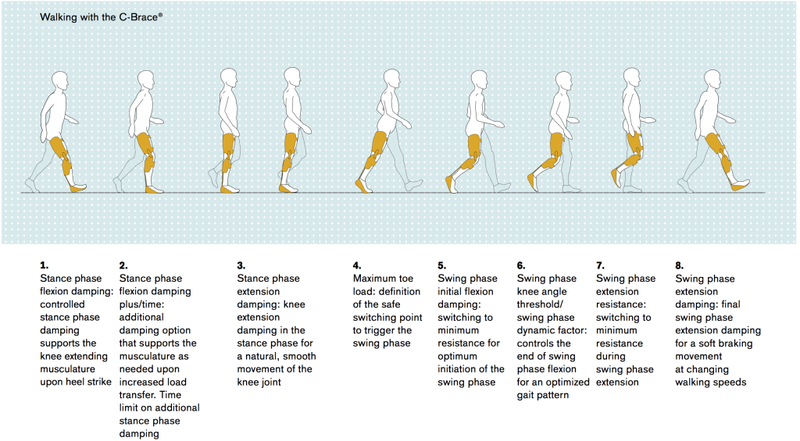 The brace can enter into deferent modes using a Bluetooth remote control (example: walking, standing, sitting, bicycling). The C-Brace is reportedly priced around £45,000 and £60,000 (The Telegraph) so it will be some time before it sees mass use. i have post polio and have heard the c-brace would be good for me…can i have info, including the price, insurance and that kind of thing. i want to walk so bad it hurts. SCI-FIT, Rise of the Private Rehabilitation Centers?